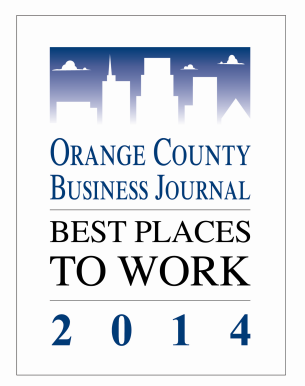 The Orange County personal injury law firm of Bisnar | Chase has made it for the third straight year to the list of 2014 Best Places to Work in Orange County. NEWPORT BEACH, Calif. - July 8, 2014 - PRLog -- Bisnar | Chase, for the third year in a row, has been named as one of Orange County's best workplaces by the Orange County Business Journal and Best Companies Group. The ranking of all winning companies will be released in a special section of the Orange County Business Journal's July 28 issue. According to the group's website, this countywide survey and awards program "was designed to identify, recognize and honor the best places of employment in Orange County, benefiting the county's economy, its workforce and businesses. Companies had to fulfill certain eligibility requirements to make this list. They needed to have an office in Orange County; have at least 15 employees working in the Orange County office; be a for-profit or non-profit business or government entity; be a publicly or privately held business, and have been in business for a minimum of one year. According to the program's administrators, companies from across the county entered what was a two-part process to determine the Best Places to Work in Orange County. The first part consisted of evaluating each company's workplace policies, practices and demographics – worth about 25 percent of the total evaluation. The second part consisted of an employee survey to assess employee experience – worth about 75 percent of the total evaluation. The employee survey delves into key issues such as leadership and planning, corporate culture, communications, job satisfaction, work environment, salary, benefits and training opportunities. An 80 percent response from employees on questionnaires is mandatory in order to be considered for the list. "It is truly an honor for us to be included in this prestigious list for the third year in a row," said John Bisnar, founder and senior partner of Bisnar | Chase. "This award goes to our entire team and is a tribute to the talents and efforts of our administrator Shannon Barker and team leaders. We are extremely proud of all our associates, our high level of customer service and the superior legal representation we provide for each and every one of our clients." Senior Partner Brian Chase says he and every member of the firm care deeply about clients and fellow team members. "We certainly have a cooperative team environment staffed by superstars in every position. We are truly a family and our clients and referring attorneys are part of that extended family." Chase said all associates at Bisnar | Chase are rewarded for excellence and encouraged to find that much-needed balance between their personal and work lives. "For us, our employees are a top priority. We help them in every way we can to reach their personal goals in the same way they play an integral part in helping the firm reach its goals. We are all equal and we are all equally committed to providing superior client representation in a compassionate and professional manner." Bisnar | Chase represents seriously injured victims of car accidents and other acts of negligence. The firm has been featured on a number of popular media outlets including Newsweek, Fox, NBC, and ABC and is known for its passionate pursuit of results for their clients. Since 1978, Bisnar | Chase has recovered millions of dollars for victims and their families. For more information, please call 949-203-3814 or visit http://www.bestattorney.com for a free consultation. We are located at 1301 Dove Street #120, Newport Beach, CA 92660.